Violinist YooJin Jang will perform a sold-out concert at Pepperdine University's Raitt Recital Hall at 2 PM on Sunday, April 7, as the final Recital Series performer of the 2018–2019 season. She will be accompanied by pianist Renana Gutman. Jang’s program includes Johann Sebastian Bach’s Violin Sonata No.3 in E Major, BWV 1016; John Corigliano’s Sonata for Violin and Piano (1963); and Robert Schumann’s Violin Sonata No. 2 in D minor, Op. 121. Applauded by The Stradfor her “fiery virtuosity” and “consummate performances,” Jang is a winner of the 2017 Concert Artists Guild (CAG) Competition, and is also First Prize winner of the 2016 Sendai International Music Competition in Japan. These two victories have resulted in a busy itinerary of international recital and concerto engagements, and also the release of two new recordings, including a CD of her prize-winning Sendai concerto performances. “Jang is a performer without fear or technical limitation” (Boston Musical Intelligencer). A native of Korea, Jang has been performing with top Korean orchestras since the age of nine, including the KBS Symphony Orchestra and the Seoul Philharmonic Orchestra. Additionally, she has appeared with the Budapest Festival Orchestra led by Ivan Fischer, Bulgaria National Radio Symphony Orchestra under Emil Tabakov, Sofia Philharmonia Orchestra with Ljubka Biagioni, the Erato Ensemble led by Sholomo Mintz, Tokyo Symphony Orchestra, Spain’s Extremadura Orchestra conducted by Jesus Amigo, and the NEC Philharmonia led by Josh Weilerstein. 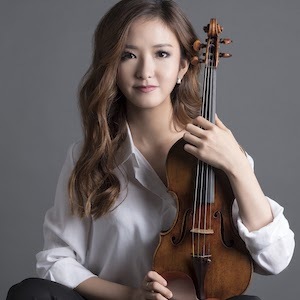 Jang’s 2018–2019 season began with a solo appearance with the Chautauqua Symphony Orchestra playing Beethoven Violin Concerto. Additional highlights of the season include performances with the Osaka Symphony Orchestra, Dubuque Symphony and DuPage Symphony, as well as recitals at the Nantucket Musical Arts Society, Patrons for Young Artists, Macon Concert Association, Dame Myra Hess Series, Rockefeller University, and Port Washington Library. In the spring of 2019 Jang will give her Carnegie Hall debut in Weill Recital Hall. Other career highlights for Jang include recitals in Boston at Jordan Hall and the Isabella Stewart Gardner Museum; in Chicago for the Dame Myra Hess Memorial Concert series; in Japan for the Sendai Competition Winner’s series in Sendai, Nagoya and at Hamarikyu Asahi Hall in Tokyo; and chamber music performances with Caramoor’s Rising Stars, Ravinia’s Steans Institute on Tour, and Marlboro Music. In 2017 two new CD’s were released, including Jang’s live performances of the Mendelssohn and Stravinsky Violin Concertos with the Sendai Philharmonic Orchestra and Junichi Hirokami, and a recital disc featuring music of Mendelssohn, Stravinsky, Grieg, and Sibelius with pianist Kae Ozawa. Her first CD, entitled Korean Young Musicians, was released on the KBS (Korean Broadcast System) label, in cooperation with Aulos media & KBS Classic FM. She is also regularly heard on the radio, including a recent appearance on WQXR’s McGraw Hill Young Artists Showcase. Jang’s latest victories at CAG and Sendai follow a long line of international competition success. In 2013, she won Japan’s fourth International Munetsugu Violin Competition, which included the loan of the 1697 ‘Rainville’ Stradivari violin. She was also a top prize winner at the prestigious International Violin Competition of Indianapolis, the Michael Hill International Violin Competition (including the Audience Prize and Best Performance of the New Zealand Commission Work), and the Yehudi Menuhin Competition. A passionate chamber musician, Jang is a co-founder of The Kallaci String Quartet in 2012, which made its international debut at the Kumho Art Hall in Seoul, Korea and the Seoul Spring Festival of Chamber Music. Recognized for her creative work in chamber music, she won the 2011 Borromeo String Quartet Guest Artist Award, and in 2009 she was awarded the Schloss Weikersheim Scholarship as part of the London String Quartet Competition. Jang has also participated in the Marlboro and Ravinia Festivals, where she worked with artists such as Menahem Pressler, Dénes Várjon, and Peter Wiley. Born in Korea in 1990, Jang holds a bachelor of music from The Korean National University of Arts, where she studied under Nam Yun Kim. She earned a master of music, graduate diploma, and artist diploma from New England Conservatory, as a student of Miriam Fried, and she is currently pursuing a doctor of musical arts at NEC. Jang will be joined by Gutman, who has performed across four continents as an orchestral soloist, recitalist, and collaborative artist. She played at venues like The Louvre Museum, Grenoble Museum, (France), Carnegie Recital Hall, People’s Symphony Concerts, Merkin Hall (New York), St. Petersburg’s Philharmonia (Russia), Stresa Music Festival (Italy), Ravinia Rising Stars (Chicago), Jordan Hall, Gardner Museum (Boston), Herbst Theatre (San Francisco), Menuhin Hall (UK), UNISA (South Africa), Marlboro (VT), and Washington National Gallery and Freer Gallery. Her performances are heard frequently on WQXR Young Artists Showcase, NY, WFMT Dame Myra Hess, Chicago, and MPR Performances Today, MN. For additional information about this sold-out show, visit the Center for the Arts website.